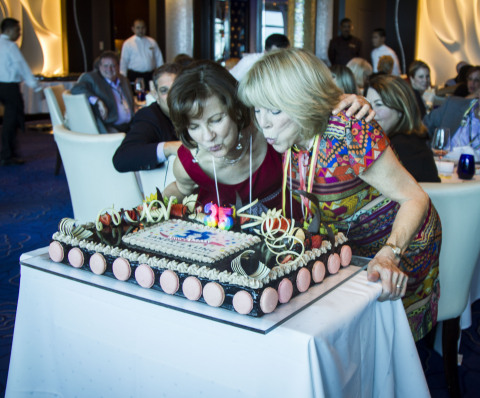 MIAMI–(BUSINESS WIRE)– On April 22, 2017, Celebrity Cruises hosted a gala 35th Anniversary luncheon for Joyce Landry & Josephine Kling aboard Celebrity Reflection, docked at PortMiami. Guests included local cruise industry VIPs, colleagues, vendors, longtime friends and supporters who gathered to celebrate a milestone that couldn’t have been predicted when the young entrepreneurs launched what became Landry & Kling Global Cruise Events – the leading producer of cruise events for the MICE market (Meetings, Incentives, Conventions, Events). When the partners founded their business in 1982, it was a bold new concept to focus exclusively on meetings at sea. Early mentors told them there wasn’t enough cruise volume to warrant specialization but they persevered and, with only $26,000 between them, set out to conquer the world. Over the years, Landry & Kling introduced many Fortune 500 companies to cruising and established a reputation for groundbreaking ideas, such as using cruise ships as dockside “floating hotels” to provide supplemental housing for city-wide conventions (American Heart Association), government summits (Summit of the Americas), and international sporting events (Super Bowl and Rio Olympics). To see Landry & Kling’s “Video Highlights of 35 Years”, more cruise line comments and photos visit 35th Anniversary Party. Since 1982, Miami-based Landry & Kling Global Cruise Events has provided cruise ship solutions and custom cruise planning for ship buy-outs, incentive cruises, cruise meetings, music festivals, theme cruises and dockside ship charters for global events. For oceans of information, visit landrykling.com and shipcharters.com or call 800-448-9002.